Nova Scotia now has more craft distillers per capita than anywhere else in the country, and distillers like Thomas Steinhart are using home-grown flavours like rosehip, mushroom, maple syrup and kelp in their award-winning products. David Gutnick's documentary is called "Home is Where The Gin Is." Inside Thomas Steinhart's distillery in Arisaig, N.S., there's a mixed bouquet of smells: lavender, lemon, cinnamon, anise, juniper, rose. They're smells that have been floating around Steinhart's family for centuries. Before moving to Canada, he grew up on a farm in Germany, learning the distilling trade like his ancestors did for 400 years. "It was always here," he said, describing the "memory for smell" that comes with the job. In just the last couple of years, Nova Scotia has become one of Canada's hottest liquor trendsetters, with more craft distillers per capita than anywhere else in the country. Sales of craft-distilled rums, flavoured vodkas and brandies are sky-rocketing, while local craft distillers are raking in international prizes and local accolades for bottles of gin that are outside the box — using ingredients like lavender, mushrooms and green pine cones. 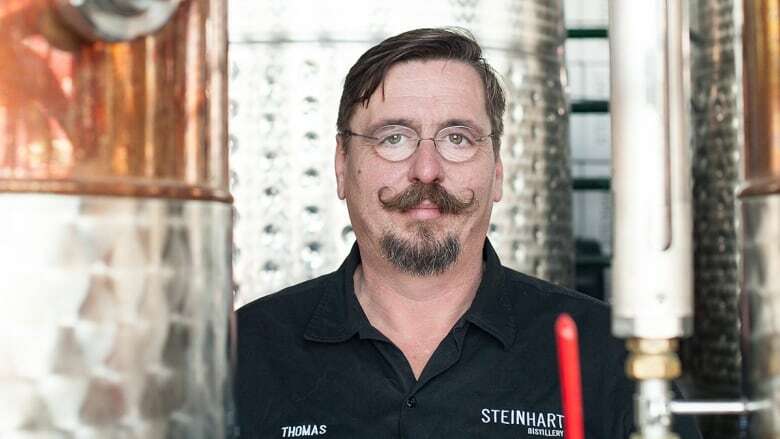 Steinhart, who recently won Canadian Gin Distiller of the Year at the Berlin International Spirits Competition, and a top prize at the World Gin Awards, can count himself among those who are distilling success. But in a part of the province where steady jobs were, and are, still hard to come by, he's also giving the economy a little boost. Steinhart employs five locals in winter, and 14 or 15 in the summer, including a cook who serves up authentic schnitzel on a bun. "Not only do I employ people, we spent last year ... maybe three or four hundred thousand dollars to local farmers. Like I'm buying strawberries, I'm buying blueberries, I buy maple syrup, I buy plums, I buy rhubarb — 15,000 pounds of rhubarb alone," he said. "And the people I buy from, they buy from me." The province's distilling industry is still tiny, but the government sees its enormous potential. In 2014, regulations governing distillers were changed to reduce the markup on Nova Scotia craft-made spirits. The markup is now around 40 to 60 per cent, instead of the 160 per cent it is for large liquor companies. That keeps the prices of local craft spirits down, and helps boost sales. Steinhart sees it as a circle. "Money goes around. It comes in here, I spend it locally and it comes back here," he said. "It doesn't go out of country. Like if I buy you know Smirnoff or Bacardi, the money's gone." Click 'listen' above to hear David Gutnick's documentary Home is Where The Gin Is.